Remember, O most gracious Virgin Mary, that never was it known that anyone who fled to your protection, implored your help or sought your intercession, who left unaided. Inspired with this confidence we fly to you, O Virgin of virgins, our Mother. To you we come, before you we stand, sinful and sorrowful. O Mother of the Word Incarnate, despise not our petitions, but in your mercy, hear and answer us. Lady of Jasna Gora, our Mother, trusting in your maternal goodness and powerful intercession with your Son, we place before you our humble prayers and petitions. To you we commend all our needs. For your presence and intercession at the miraculous shrine at Jasna Gora and for the countless graces obtained for us in centuries past we thank you, Our Lady of Czestochowa! For your gracious reign over us, for your powerful help throughout history, especially in difficult periods of suffering, we thank you, Our Lady of Czestochowa! For the maternal care with which you ever surround us, leading us to your beloved Son, strengthening our faith, drawing sinners to conversion and comforting the sick, the sad and the faint-hearted, we thank you, Our Lady of Czestochowa! 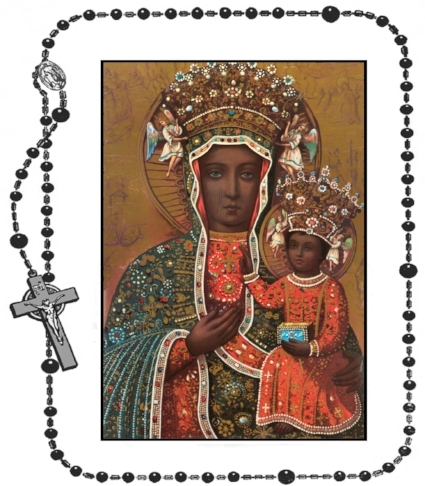 For guarding us against the flood of indifference, unbelief and atheism, we thank you, Our Lady of Czestochowa! For keeping vigil over us through your picture in our churches and homes, we thank you, Our Lady of Czestochowa! For reconciling our marriages and families in a bond of love and fidelity, we thank you, Our Lady of Czestochowa! Accept our humble tribute of gratitude even though we know that our thanksgiving can in no way compare with the greatness of your mercies. The graces we have received through you inspire us with hope and desire for further fidelity toward you. O Mother of God, you constantly urge us, "Do whatever He tells you," Obedient to your inspirations, we stand ready in gratitude to serve you in your kingdom, O Mother of the Church. Amen. O great Mother of Jesus the God-Man, for your gracious reign over us; we love you and venerate you! O Mother of Sorrows, you who are especially close to us in time of suffering and sickness; we love you and venerate you! O Guardian of our conscience, helping us to a constant renewal of our life; we love you and venerate you! O Help of Christians, you protect all those who are persecuted and held in bondate; we love you and venerage you! O Mother, you aid us in our difficult pilgrimage to our heavenly Father; we love you and venerate you! O Mother, you call on us, your children, to participate in the salvation of mankind; we love you and venerate you! O Lady of Jasna Gora, may all who venerate you feel now your help and intercession. Make it your continual care to pray for the people of God, for you were blessed by God and were made worth to bear the Redeemer of the world, who lives and reigns forever. Amen. In dangers threatening your people be our help and our protection, O Lady of Jasna Gora! In our constant concern for preserving the Catholic heritage be our help and our protection, O Lady of Jasna Gora! In our efforts to keep faithful to God, to the Cross and to the Gospel, be our help and our protection, O Lady of Jasna Gora! In danger of succumbing to evil habits, be our help and our protection, O Lady of Jasna Gora! When we are oppressed by doubts and temptations against faith, be ouro help and our protection, O Lady of Jasna Gora! When we feel lonely and abandoned, be our help and our protection, O Lady of Jasna Gora! O Mother with the Divine Infant in your arms, through your sacred image in Czestochowa, you remind us of the constant presence of your Son and your motherly solicitude as a source of strength and courage in our daily trials, difficulties and labors. Strengthen us in our faith and obtain for us the power to renew our lives in the spirit of God's commandments and the Gospels of Christ. Amen. For our negligence in the faith and for the religious indifference through which we have strayed so often from God unmindful of his presence and love, we ask you, Mother, intercede for us! For our conduct which has not always been in accord with our holy faith nor with the indignity of a child of God, for sins against life, for drunkenness, selfishness, carelessness, envy, social discord and lax morals, we ask you, Mother, intercede for us! For being so preoccupied with ourselves that we did not see the needs of our brothers and sisters - the hungry, the homeless, the sick and the lonely, we ask you, Mother, intercede for us! Mother of God, Immaculate mary, to you i consecrate my body and soul, all my prayers, works, joys and sufferings, all that I am and possess. With eager heart, I dedicate myself to you in slavery of love. I give you complete freedom i making use of me for the salvation of men and the assistance of the Holy Church of which you are the Mother. From now on I wish to do everything with you, through you and for you. I know that by my own strength I shall accomplish nothing. You; however, can do everything that is the will of your Son, and you are always victorious. Grant, then, help of Christians, that my family and my country may truly be the kingdom of your Son and yours. Amen. It is to you, O holy Mother of God that we go for refuge and protection. Look kindly on us as we cry to you in our need. Glorious and blessed Virgin, be with us always and rescue us from every kind of danger. Amen.